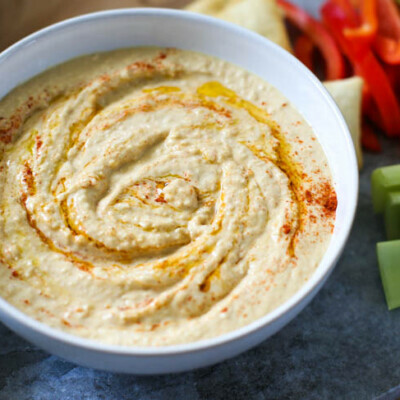 Making homemade hummus in the blender (or food processor) is easier than you think. The hummus ingredients come together quickly leaving you with healthier and tastier side dish than you could find at the store. Add all ingredients except the garbanzo beans to a blender*. Add half of the beans and blend until smooth. Add last of the beans and blend until smooth. Add more bean water to thin out hummus as needed. You may have to use a spatula to scrap the sides and bottom to make sure all everything is pureed. *If using a food processor, you can add the first half of the beans to the liquid ingredients in this step.